Street stands selling hot roasted chestnuts are an ubiquitous part of the winter scene in Zürich, as it is in many northern European cities. 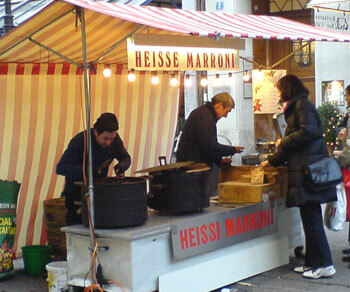 The German term for them is heisse marroni (hot chestnuts), though in Schwiizertütsch (the Swiss-German dialect) they are called heissi marroni. At the stand on the Füssli-Strasse, which is right off Bahnhofstrasse next to the St. Annahof department store, the upper sign is in Hochdeutsch and the lower sign is in Schwiizertütsch. 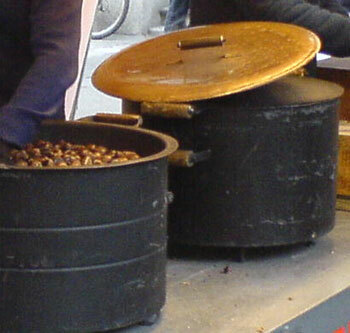 The chestnuts are roasted in huge iron pots which are lined with hot charcoal. The chestnuts, which are pre-split individually, are roasted on a rack that sits above the coals within the pots. The roasters stir them about in between handing out the little bags of hot tasty morsels. 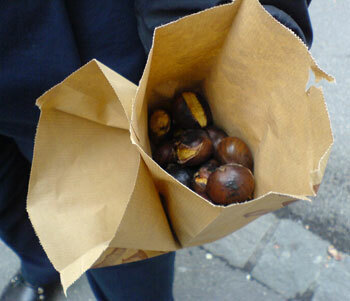 I've never seen these Siamese-twin bags anywhere else - in one side are the chestnuts, and the other side is to put your chestnut shells in. To me they are very Swiss - a neat and tidy solution to a particular problem. (The Swiss share this ability to come up with little solutions, and a fanatical attention to detail, with the Japanese. Not to mention the obsession with cleanliness.) You don't see any litter on the ground around the stand. The only problem with roasted chestnuts is that they are so more-ish. Submitted by maki on 2006-01-29 20:14.